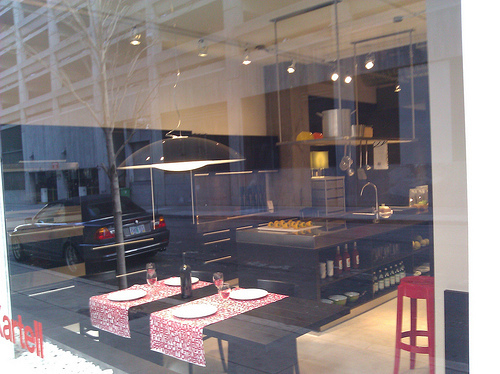 Walking to the spa to have a massage today, I stopped and peered in the window to gawk at this gorgeous huge designer dream kitchen at Kartell, as seen above. It makes me frown when I see these huge display kitchens. Why? Because I already have a bad case of kitchen envy. Our apartment is spacious by San Francisco standards, but it has a teeny galley kitchen designed for short people who don't actually cook any food from scratch. Every inch of my three countertops is covered with appliances — toaster oven on one, kitchen aid mixer on another, coffee maker and bean grinder on the third. The cramped quarters mean that you'd be claustrophobic while cutting up veggies if the kitties are underfoot eating their dry food. Some day, I'll have a kitchen big enough to cook and take pictures in. With an effective hood over the stove and with a window for airflow. But until then I'll suffer silently with my kitchen envy, frowning at the model kitchens I encounter as I go about my day.